A Liebherr Men’s World Cup debut in the Liège in 2008, when he concluded matters in third place, now, nine years later on his return to the Belgian city, it was exactly the same finish. On the afternoon of Sunday 22nd October, the top seed, he accounted for Frenchman, Simon Gauzy, the no.7 seed, in six games (11-5, 11-13, 6-11, 11-5, 11-7, 11-9) in the bronze medal contest. The third step of the podium and for the third time at a Men’s World Cup tournament; in addition to 2008 when he beat Kalinikos Kreanga of Greece in the final, the bronze medal position was also his lot in 2009 in Moscow. On that occasion having lost to Vladimir Samsonov of Belarus, the eventual winner, he overcame Korea’s Oh Sangeun in the play-off round. Defeat for Simon Gauzy but most certainly he can hold his head high. He gave Ma Long a most severe test; one wondered when he established a two games to one lead was there another surprise defeat for Ma Long in the offing? It was not to be, Ma Long re-grouped to win the next four games and as in all five previous appearances secured a place on the podium. Meanwhile, for Simon Gauzy, he becomes the third Frenchman to reach the semi-final round of the Men’s World Cup. Jean-Philippe Gatien is clear of the field. Notably he won 1994 in Taipei City when beating Belgium’s Jean-Michel Saive in the final, having been the runner up in 1991 in Kuala Lumpur when losing to Sweden’s Jörgen Persson. Additionally in 1995 in Nîmes, like Simon Gauzy, he finished in fourth place being beaten by China’s Liu Guoliang. The one other Frenchman to reach the semi-final at a Men’s World Cup is Christophe Legout; in 1997 in Nîmes, he was beaten in the play-off contest by Vladimir Samsonov. 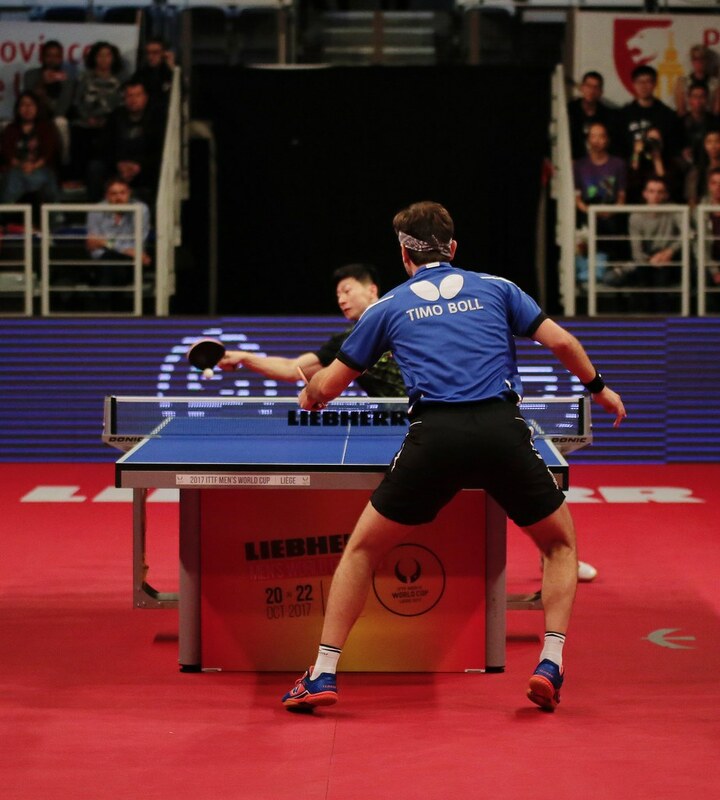 Now Dimitrij Ovtcharov versus Timo Boll awaits: the final.